BOTRANS LTD follows "In-House" procedures laid down under the ISO 9001:2008 quality management system requirements. All work is undertaken through a management quality control manner and whilst the Company has not fully implemented the full accreditation, the system is in place and followed rigourously by Management and staff throughout the organisation. 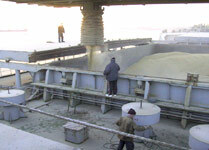 In accordance with the requirements of The Grain and Feed Trade Association (GAFTA - of which BOTRANS LTD are a Category C Superintendent Member and has been since 2002) the Company is fully accredited according to ISO/IEC 17020-2012 as an inspection body, Type A, in the scope of "Inspection of suitability of vessels for the carriage of grain cargo", "Quantity inspection of grain cargo on marine transport" and "Quality inspection of grain cargo during transfer by marine transport" in respect of grain, seeds and pulse cargoes from Northern Black Sea Ports and undertakes annual audits by the Global Accreditation System Corporation (GAS) to maintain this accreditation. More specific assessment of the captioned Inspection work performed by BOTRANS LTD can be found in our information pages. Need more information - please feel free to contact us and to discuss your specific requirements.